Replace Microsoft InfoPath with Rich Forms! InfoPath has an expiration date. Unlike most form solutions, skybow has a way to migrate your existing InfoPath forms to skybow's 100% web, 100% SharePoint, and 100% scalable Rich Forms. It's a joint effort with Rencore, the SharePoint customization management specialists. 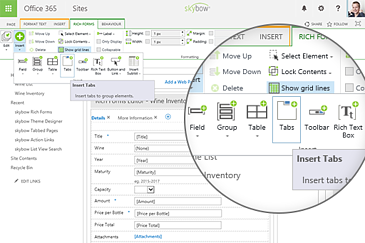 Our MVP Adis Jugo writes about how to replace InfoPath with skybow Rich Forms. skybow Rich Forms provides a powerful editor enabling you to design dynamic SharePoint ListForms with business logic as easily and flexibly as adding content to a publishing page or writing formulas in an Excel sheet.